Specialized Dog Carriers For Your Motorcycle! Who says you can’t take your dog with on your motorcycle for those quick errands? Purchase a dog carrier and your favorite pet can join you. Mind you, this isn’t only for short trips but even the longer ones. The catch is to pick the right one that’s secure & comfortable for both you and your dog. But what constitutes a good motorcycle pet carrier? Obviously top of the list has to be safety considerations if you expect to reach your destination safely. Still, given the number of carriers at your disposal, deciding on one isn’t easy. That’s why we’ve decided to go over a number of factors you must note before buying one. Hopefully, these factors coupled with a list of our top recommendations will make your selection process quicker. Want a carrier that allows for some quality bonding time? Pick this K9 sport sack that allows you to strap your dog directly on your back. 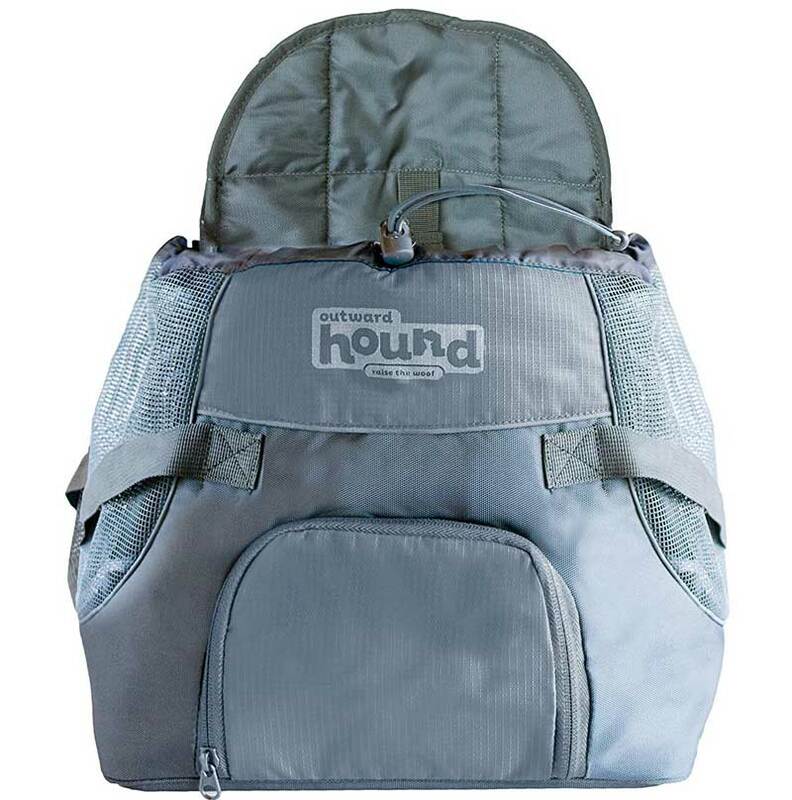 It’s the perfect backpack for the smaller and medium sized dog and is available in three different sizes. You’re bound to find one that matches your dog’s exact shape and size for optimum comfort. 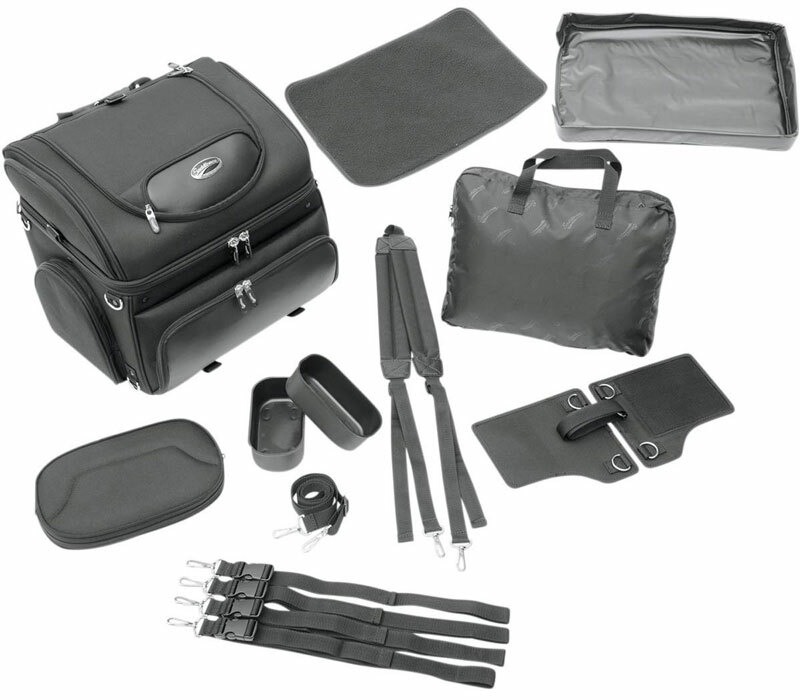 It embodies everything you want in a backpack carrier from ease of use to safety. It’s also balanced and very comfortable for both you and your dog. But, most importantly, it’s a safe carrier. The cooling side panels allow for adequate ventilation so your dog can literally enjoy a breath of fresh air throughout the ride. For your dog’s safety, it offers not one but five different safety features to give you peace of mind during your drive. The two side pockets are adjustable for your added convenience and will come in handy when you want to carry a water bottle or a treat. Unfortunately, there are no extra storage compartments to place your wallet or keys. Your shoulders won’t be drenched in sweat after your ride thanks to the ventilated shoulder straps. This is further enhanced by the straps’ moisture wicking capabilities. We just wish there was a bit more shoulder padding to prevent fatigue especially if your dog is on the heavy side. Nonetheless, the chest straps go a long way in relieving some of the pressure. 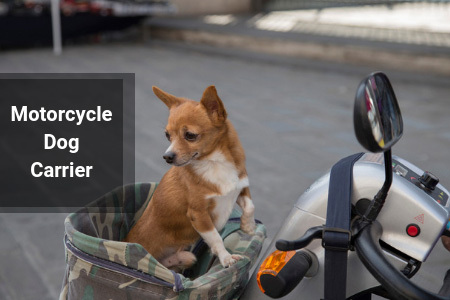 Have a smaller pup you want to take with on your motorcycle ride? Then this might be the carrier for you. This front facing carrier is specifically designed for the small- to medium-sized dog. 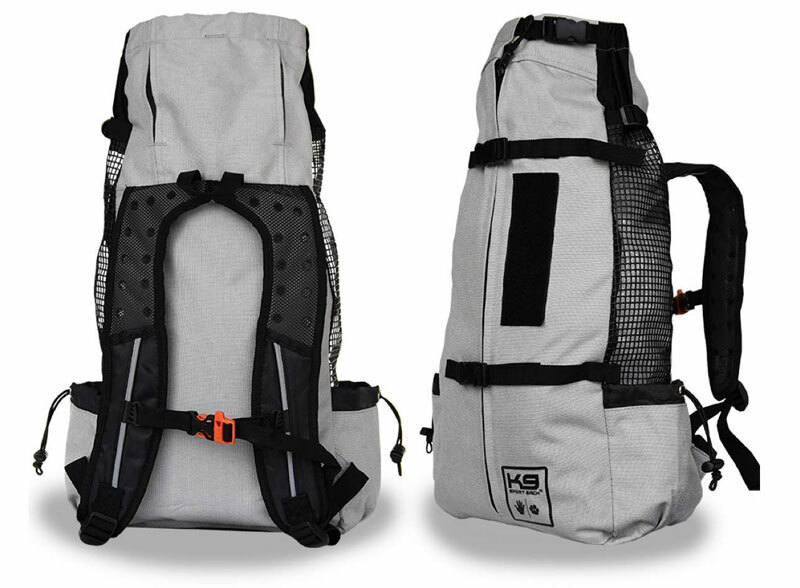 Like the K9 Sport sack, it’s also available in multiple sizes. However, the small size is roughly 12” x 7’ while the medium is 15” x 10”. You might need to take the measurements seriously as it’s not meant for the taller dogs. If it happens to stand, most of its body will stick out which increases the risk of the dog falling out. The lightweight mesh siding is designed to keep your dog cool during a ride in the warmer weather. It does get a little hot inside the bag after a while. Placing a cool pad between the dog and your back will help alleviate the problem. You’ll appreciate that it’s built to last with the incorporation of durable nylon fabric. Not only is the fabric strong but it features water resistant properties which also prolong longevity. You’ll appreciate the two pockets you can use to store items. You can use the large front pocket to store the treats and toys. Unlike the K9, there’s provision to store your small valuables in the inside pocket for added security. With regards to comfort, the safety harness is designed to clip comfortably to your dog’s collar. This is a feature most other brands don’t have. Here is yet another hands-free front-facing carrier worth considering. What makes it stand out from the rest is its unique “leg out design” for added comfort. Not only is there enough leg room for your dog but the spacious neck also allows the dog to rest comfortably. Nicrew not only took your dog’s comfort into consideration but yours as well. That’s why they made sure the straps aren’t only wide but padded for your carrying ease. On top of that, the carrier is pretty easy to use. It helps that it’s a relatively lightweight unit so the only weight you need to worry about is that of your dog. Its versatility means you can decide to carry your pet either from the back or the front. It’s available in four sizes ranging from small to extra large. You’re guaranteed to find one that matches your dog’s size. Just be sure to take note of the dimensions and measurements so you don’t buy one that’s too small or too big. It’s advisable to add an extra 2” to the measurement if you’re buying for a small pup and 4” for the larger dog. The only concern we have regarding this carrier is whether it’ll last long. The zippers aren’t made of the best quality which makes its durability questionable. Here’s another carrier also specifically made for the small dogs. The only major difference is you must be prepared to spend a lot more on this brand because it’s expensive. Its versatility is probably one of the major reasons for this high price. When you’re not using it as a carrier it also transforms into an effective cargo bag. Another impressive feature is the dual purpose multiple air vents. They provide openings that ensure your dog is kept well ventilated during the ride. The same vents allow for easy access to your pet or cargo. This compartment is quite spacious and includes a removable bottom tray which allows for a quick & easy clean up. Inside the carrier, you’ll find a resting pad for your pet’s added comfort. Along with the resting pad you can use the food and water trays organized into neat compartments. The mounting systems are quite intuitive. They make it easy to attach to the bag to either your motorcycle seat or luggage rack. Detaching is also quick and simple because it’ll literally take you a couple of seconds. If a portable carrier is what you’re looking for, then look no further. Just make sure you’re not working on a budget because it’s the most expensive on the list. And deservingly so! 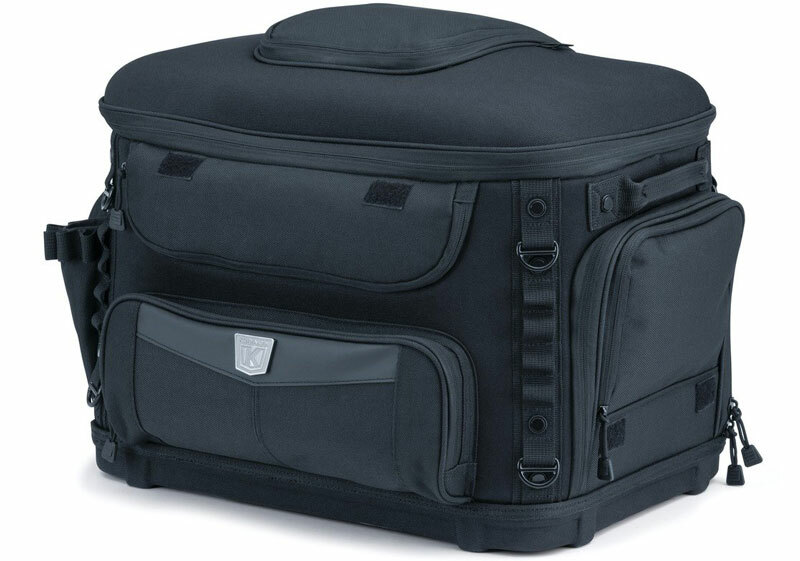 It’s dubbed one of the safest and most versatile motorcycle carriers on the market. The solid construction is what impressed us more about this product. 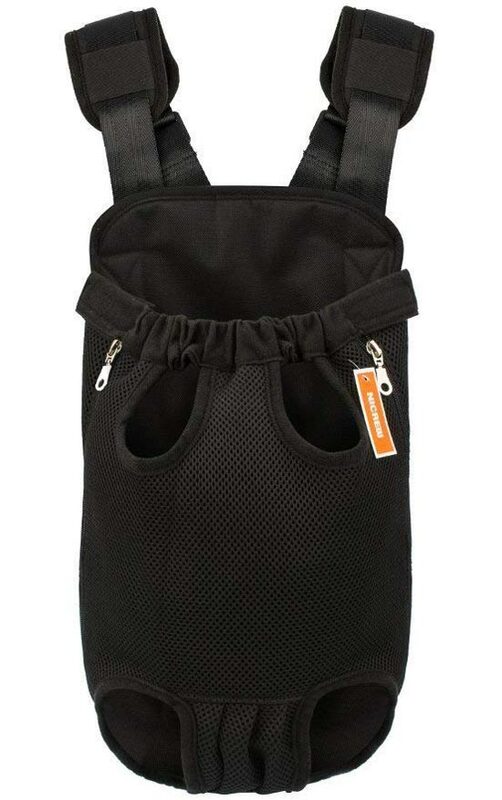 The internal frame is quite strong and the rigid bottom will provide your pet with ample support & protection. What sets it apart from the other carriers is it comes with a couple of pet amenities including an internal adjustable leash and a removable stash pouch. The top window opens to allow your pet to pop its head out. There are four mesh windows that’ll ensure the carrier is well ventilated. 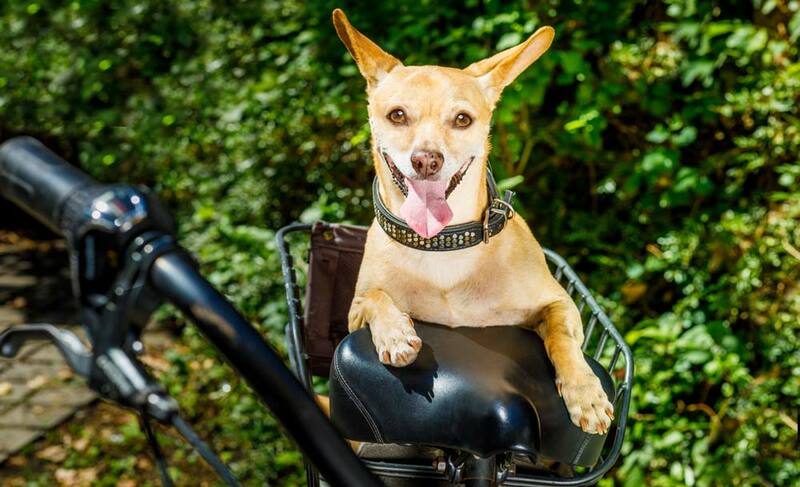 Your pet can also have a clear view of its surroundings during the ride. The good thing about this carrier is you can ride with it in any weather. The UV rated 1200 denier textile fabric makes sure of that. This carrier also comes with a removable rain cover for added protection. You’ll appreciate that it comes with side mounted handles making it a portable unit that’s easy to detach. The first thing you need to decide on is the type you’re going to invest in. Naturally, the type you pick will largely depend on your dog’s specific needs. Below are the most common styles. With this crate style dog carrier, you basically mount it onto the back of your motorcycle. You can also attach it on the tank of the motorcycle. Either way works fine so the one you pick is really a matter of preference. The reason to opt for this one is it offers a lot more protection—particularly in the unfortunate event of an accident. Not only will it protect your dog from a crash but it also shields it from floating debris and strong winds. This carrier only becomes a problem if you’re the type of person who wants to travel with their dog close by. Perhaps you’re the pet owner that prefers to have your dog strapped directly to you? Unfortunately, this type simply won’t allow that. Your bonding session is made impossible because of the separate carrier. Ultimately, you have a decision to make—and a tough one at that. Will you prioritize safety over bonding? You decide. The pet owners who prefer being in close proximity with their dogs will rather opt for this type. As the name suggests, you literally strap your dog directly onto your back. The general look is reminiscent of carrying a backpack. The carrier is fitted on your back and the dog goes into the pack portion, then you simply strap it on your back. Needless to say, the upside is you get to enjoy extremely closeness with your dog. On the downside, not much protection is guaranteed from weather elements or in worst case scenarios, crashes. Regardless of the distance, you’ll be traveling with your dog, a carrier with effective absorbent properties is the one you want. Either that or by the time you reach your intended destination, your dog is likely to be covered in its own urine, as there’s no telling when they develop the need to go. Where’s the comfort in that? The best way to avoid this is to pick a carrier with absorbent flooring. This will go a long way in absorbing some of that urine so your dog is kept dry and comfortable at all times. Alternatively, you can opt for one that has removable flooring. This makes the clean-up process much easier. We’ve probably mentioned comfort a couple of times so far in this article—and with good reason. It goes without saying: Your dog needs to be as comfortable as possible throughout the duration of the ride. There must be ample space in the carrier which means it must not be too cramped or too big. A small carrier is downright uncomfortable. Pick one that’s too big? You risk your dog sliding from side to side inside the carrier making for a very bumpy ride. A unit that’s slightly padded is also a good idea. This will especially come in handy if you’re planning a long trip. We’d like to believe you don’t plan on making a repeat purchase any time soon. For this to be possible it means purchasing a durable unit that’s built to last. One thing that’ll guarantee longevity is the fabric used in the construction of the carrier. You want one made of durable fabric such as heavy-duty plastic or thick mesh. If you can find one reinforced with an aluminum framework, even better. The advantage of such materials is it not only lasts long but offers your dog maximum protection. This is thanks to the sturdiness and strength of the material. Your dog’s safety is paramount as you transport it in this carrier. This is why looking for one with locking mechanisms in place is ideal. Bear in mind, most of these carriers usually have multiple openings to allow your dog to stick its head out. While on the subject of security, we’ll quickly discuss the importance of attachment points. Strong attachment points will ensure the carrier is attached securely either to your body or motorcycle. The trick is to ensure the carrier is balanced—not tilted on either side. This is largely dependent on the strength of the attachment points. You also don’t want your dog slipping in & out and strong attachments will ensure this. This is one of the most important factors worth considering, especially if you’re planning on a long trip with your dog. Will your carrier be strictly attached to your motorcycle at all times? Do you plan on using it as a crate when you rest? Answering these questions will determine the type you pick. If you do plan on constantly detaching and attaching it then a carrier that’s easy to remove is ideal. Also, if you can get one with handles, it’ll make the process much simpler and quicker. Does the carrier allow for good air circulation? Remember the goal is to transport your dog as safely and comfortably as possible. Opting for a carrier with mesh openings is best as it’s designed to allow adequate ventilation. This way, your dog is kept nice and cool at all times. Besides that, mesh openings are a much safer option as they greatly reduce the risk of dogs falling out. For a unit that’s going to be constantly exposed to varying weather elements, picking one that can withstand such is best. It’s in you and your dog’s best interests to buy a carrier with a waterproof coating. If you’re going to be venturing into the cooler climates, then a carrier with insulation capabilities is also ideal. Not only is your dog kept warm but these properties will greatly prolong the life of the unit. When it comes to your “best friend” it doesn’t hurt to take extra precaution to ensure your dog’s safety for the duration of the trip. A pair of goggles on your dog isn’t such a bad idea when going for a motorcycle ride. If anything, it works wonders in protecting your dog’s eyes from flying dust and debris during the ride. You can also pair them up with a helmet. It’ll come in handy in the event of a nasty fall or crash. Hopefully, this article was informative—because your dog deserves the best. The one you pick will depend on your budget and preference but ultimately it must offer comfort & protection. No need to leave your dog behind anymore, pick any one of these and enjoy the ride together.